Wherever you are in your story, it’s a good time to envision. I’ve mentioned before that NaNoWriMo is a time of strong magic when the veil between what you write and what you experience is thin and more permeable than usual. You can use these vignettes to create future experiences, and to remember that you wrote them when they later occur. P.S. 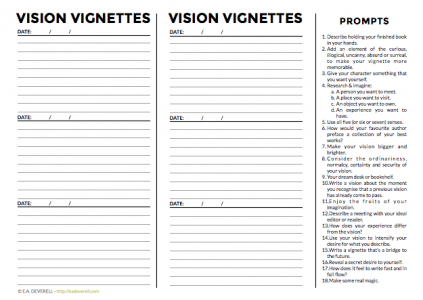 You can keep a copy of this worksheet in your journal for practice vignettes or flash fiction too. Last few days to enrol in these online creative writing courses. Click here & join the Lady Writers League.